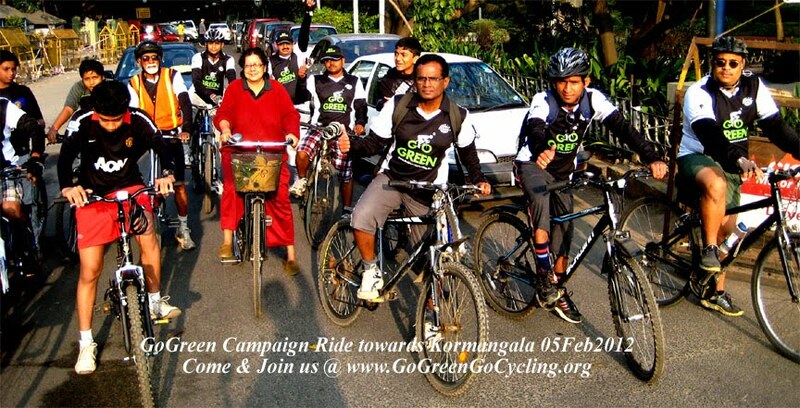 GoGreen campaign Ride towards Koramangala 05 Feb 2012 - GGI-Group size: 4000+ Professionals, Increasing on day to day basis, Come & join us 2 serve Mother Nature. This time the breakfast point @ kormangala was "Krishna Cafe" to taste a flavor of chenni :). Food was tasty but felt little costly then compared to any darshani hotels.. We dispersed after coming out of the hotel @ 9:30am. on our way back one of the school going kid was not able to cope up with the ride, Srinivas gave the kid energy drink but he was mentally blocking himself to pedal more theirafter Darshan switched his Scott cycles with his kids cycle just to boost his morel which worked for 2 km's and again he was down the seat. Finally they need to walk and reach the starting point.. 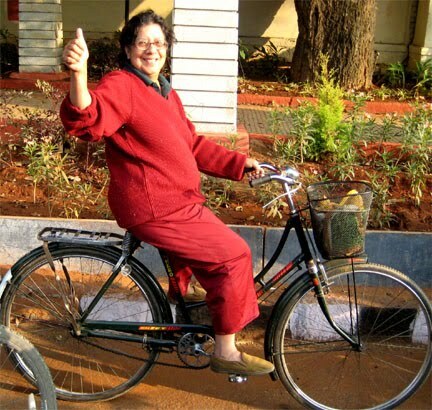 This is Supriya DasGupta of age 60 & loves to cycle with her old cycle, Came in early morning @ 7:00am to Cubbon Park and was waiting to meet the group. She almost moves every where with her cycle which she call's as Old lady"
i am an educator and writer. a multi skilled person- a bit unusual. 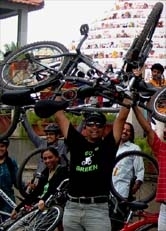 i believe in cycling as this is a major way to reduce the load on the env. i am not mouthing this- i have felt it strongly. 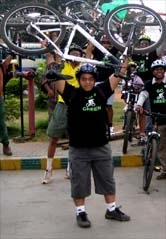 i come from Bengal- where the affluence level is less than it is in the south- hence the common man rides bicyles. i found this to be very suitable to the situation- bkies are nimble, they are silent and they take up no place for parking. 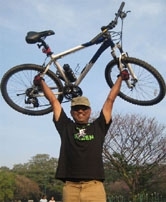 much to the amusement of the elite of calcutta, i bought a Hero ladies bike- and started to cycle - i got to my place of work in 15 mins- 10 km - i just coasted thru the traffic from one end to the other. i am a creative person- an artist and photograher- so a cycle is just the thing for roadside sketching and stop and go photography. i have odne a lot of art works this way when i was back in calcutta. everyone was very patient with me- i know that there are very active members in the group. This was a short ride- i would love to join you for longer rides- but i am not too fit. also my old lady - i have a name for her - she is Kittur Rani Chennamma- (my bike) is a bit slow on the gradients. the reason also i am joining the clu is because cycling is really very good for CAD/ arthritis and other age related health probs. this could also be another focus of the club- to platform cycling for middle aged health issues. thanks for your interest. Supriya DasGupta..